JOHN 1:12 KJV "But as many as received him, to them gave he power to become the sons of God, [even] to them that believe on his name:"
9That was the true Light, which lighteth every man that cometh into the world. 10He was in the world, and the world was made by him, and the world knew him not. 11He came unto his own, and his own received him not. 12But as many as received him, to them gave he power to become the sons of God, even to them that believe on his name: 13Which were born, not of blood, nor of the will of the flesh, nor of the will of man, but of God. 14And the Word was made flesh, and dwelt among us, (and we beheld his glory, the glory as of the only begotten of the Father,) full of grace and truth. 15John bare witness of him, and cried, saying, This was he of whom I spake, He that cometh after me is preferred before me: for he was before me. 1:12 But as many as received him - Jews or Gentiles; that believe on his name - That is, on him. The moment they believe, they are sons; and because they are sons, God sendeth forth the Spirit of his Son into their hearts, crying, Abba, Father. 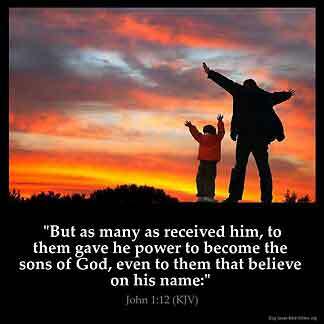 Joh 1:12 But as many as received him, to them gave he power to become the sons of God. The Revised Version reads, "children of God", which is better. While the nation rejected him, some received him. To such as receive him in every age he gives power to become the children of God. The manner in which he is received is given: [Even] to them that believe on his name. It is not declared that they are made children by believing, but to the believer he gives the "power to 'become'" a child. When one believes in Christ, his faith becomes a power to lead him to yield himself to God and to receive the Word into his heart. The name of God is to be praised for the inspiration and everything. One amazing thing I 've come to discover about God is that He has a blessing attached to every command or instruction, here or hereafter. It takes the Grace of God to really believe on His name...it 's not about human knowledge and philosophy. May God give us that GRACE to wholly Believe and as well Receive HIM...for RECEIVING starts with BELIEVING.